If you weren’t watching the Louisville v Duke college basketball game on Sunday then you missed one of the most gruesome public sports injuries you may ever see. If you want to see it for the first time or the 15th it can be found on some major Internet sites. The bigger question is why are so many people outrages by CBS’s replays? Louisville’s Kevin Ware broke his leg right after contesting a jump shot in the first half of an Elite 8 match up against Duke. He landed right in front of his teams bench. It was immediately apparent that his injury was serious. Several of his teammates looked immediatly away while others were doubled over on the court in shock. Players and Head Coach Rick Pitino had tears in their eyes as the medical staff attended to Ware. Turns out that his leg is broken in two places and the bone was sticking out. The reaction on Twitter was first asking for prayers then by half time of the game the conversation turned to ‘Why are people showing this replay?’ CBS did not show a replay of the injury during their half time show citing the gruesome nature of the injury. They did show several replays after it had happened. Last fall several media outlets replayed South Carolina’s Marcus Lattimore’s injury in which he dislocated his knee tearing just about every ligament imaginable. ESPN (who broadcasted the game in which Lattimore was injured) replayed the injury more than CBS did. Are all injuries not created equal? Gruesome injuries are just that, gruesome. People turn away in shock and horror and rightfully so. It doesn’t help anyone to see something like that multiple times. Once is enough. The uproar over seeing Ware’s injury a few times vs no uproar over seeing Lattimore’s several times does lead us to look at the circumstances. The Louisville v Duke game is on National TV during March Madness. The winner goes onto the Final Four. It’s a big deal. Lattimore’s injury happened in a conference game during the regular season. The game was also Nationally televised however it was not the main game of the day, kicked off and was on ESPN. Did the high profile stage on which Ware was injured lead to more people seeing it? Of course. Ware plays basketball and Lattimore football. Do we expect more gruesome injuries in football than in basketball? Are we more mentally prepared for the possibility of a gruesome injury during a football game because of the physical contact and not in basketball because they don’t wear pads and helmets? Either way you look at it a gruesome injury makes the game secondary and rightfully so. Let’s also not forget that in the NHL superstar Sidney Crosby had emergency surgery Saturday night after being hit in the face with a puck. He has a broken jaw. Last weekend Denny Hamlin of the #11 car in NASCAR suffered a compression fracture in his back after a wreck. injuries are going to happen in sports and sometimes they are very, very hard to watch. Let’s hope we see less of them the rest of the year. 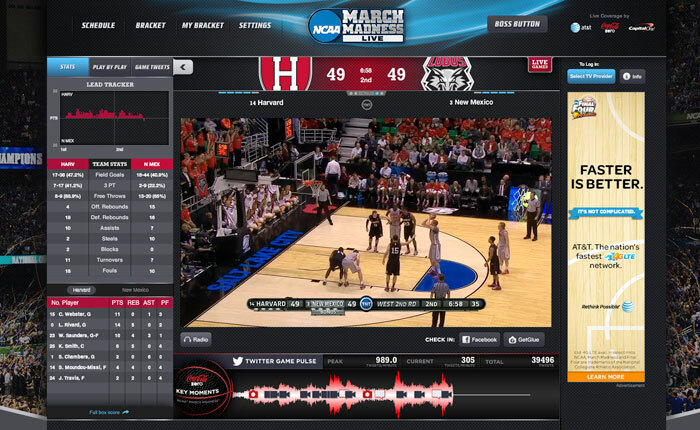 It seems almost arcane to think that the NCAA tournament wasn’t streamed live and available everywhere. That you could only watch whatever regional games was on CBS is almost unthinkable in this day and age. It wasn’t all that long ago that this was the reality of the situation. Now, you can see every game on just about any device from your desktop to your tablet to your phone and of course your television. But it’s not good enough because in the end, the user is still getting screwed. In 2003 when the NCAA and CBS began streaming March Madness it had two main online sponsors, Dell and Marriott. We shouldn’t be surprised that the live streams over delivered on viewers. In the early years there was a limit on the bandwidth available so if you wanted to watch games online and not pay then you had to stand in a digital que. If you wanted to pay then you got access immediately. Now, massive improvement. No waiting except for the excessive amount of ads on the first two days. On Thursday, the first full day, I personally sat through 2 minutes of ads (a lifetime online) before being allowed to watch a game. Maybe that was one time only log in or bad timing but none the less. Online History of the NCAA Tournament. 10 years in the experience has improved as have the ad dollars. However, the user experience is still not where it should be. Why? Because this is a business run by TV executives and the NCAA makes 90% of their revenue from March Madness. The last contract that the NCAA signed with the TV networks (CBS and Turner Sports) is for 14 years and $10.8 billion. In 2011 the networks made $738 million from TV ad revenue and $60 million in online ad revenue in 2012. This is a lot of money and the cash cow continues to be TV advertising therefore the sacred cash cow will be protected at all costs. If the NCAA and the TV networks were really smart they would split the TV and online experience into two separate groups then manage and sell them separately. By doing this they would accept that the TV and online experiences are different. This would be the entertainment equivalent of walking on water. However if this was done, and online people could run the live streams you would see March Madness not only on Apple and Google’s Android platform but also on XBOX (Microsoft’s gaming platform) Playstation Network (Sony) and Google’s video platform, YouTube. They could also sell it to other online providers like Yahoo and AOL. Best part, it would an experience that fits the medium. The TV people would scream that this is taking away from their TV ad revenue. Not true. Why do people watch on computer, tablet and phone screens? CAUSE THEY DON’T HAVE ACCESS TO A TV! If they did, they would be in front of their 50 inch TV screen and not have to think about mobile provider data rates or buffering. It’s also not the same experience and it’s time people accepted that. If you are watching the games on your 50 inch TV through your cable or satellite provider your signal will not diminish if your 5 neighbors are watching it too. If your watching online and the same 5 neighbors begin watching the Twilight movies via Netflix your viewing quality may degrade. You can flip between games much faster on TV than you can online too. So let’s stop pretending that this is the same. The advertisers make out too. You’ll have more target ads online then you will on TV and that is only going to improve over time. So if your not in the market for a car but you are for a pizza then guess what? Advertisers will have a better chance of getting their product or service in front of someone who is more inclined to purchase. Finally, do not GEO BLOCK the online experience. If a someone is traveling to Italy during March Madness then make sure they can see the games. If they are that committed to watching March Madness at 2am on a Saturday then God Bless that fan. 1) A major sport such as the NFL negotiates this into their next set of TV contracts. 2) Viewership or ad revenue declines for TV. In the end the user is not the concern, even if the TV networks and the NCAA say they are. It’s about money but by not focusing on the user and accepting the idea of disruption then the NCAA in particular is leaving lots of money on the table. As we’ve covered before, travel can take it’s toll on a people. From airports to traffic to weather to timezone changes. It’s rough. Playing at home has it’s disadvantages too. Some teams have a tremendous home field (or ice) advantage. The University of Miami football team once won 58 straight home games between 1985-1994. Cameron Indoor Arena on the campus of Duke University is an amazing atmosphere, Fenway Park in Boston is historic, JELD-WEN Field in Portland is unreal, the Bell Centre in Montreal can just make your jaw drop. 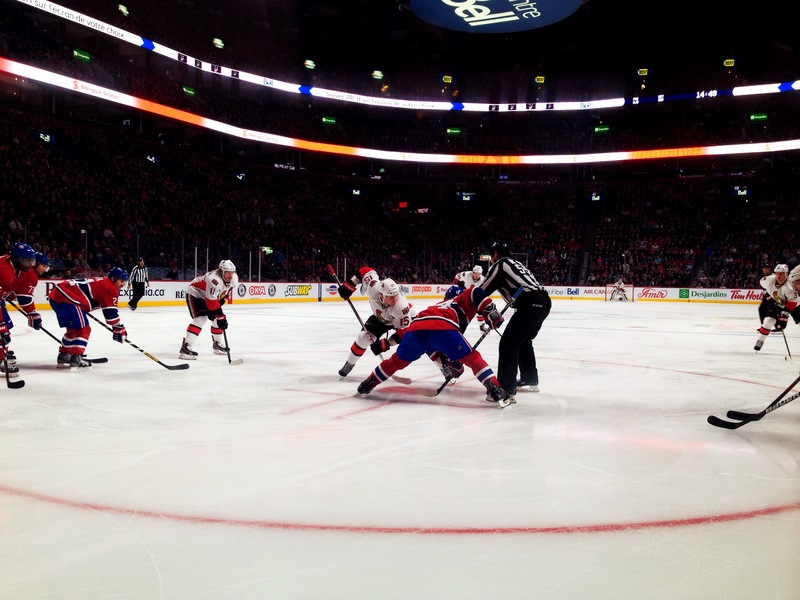 But what happens when a road team comes to these great atmospheres? They’re excited too! It’s one thing for a road team to get up to play a game in Columbus, OH at Crew Stadium and another to get ready to play in front of the Timbers Army in Portland. Grant Wahl did a player survey before the start of the 2013 MLS season. Which were places had the best atmospheres in MLS? Seattle and Portland of course. Who had the worse? Dallas with Columbus coming in 3rd. With these atmospheres you can get a better than expected performance out of people because they are so energized by the atmosphere. Playing at home also brings in the distractions. You’re home and people know where to find you vs being locked in and focused on the road where the bills and family are not out of sight and usually out of mind. Talk to fighters in the UFC. Usually when they fight in their hometown people come out of the woodwork looking for tickets and deals on hotel rooms. The road can allow people to focus in more on the game. Home games overall are better than road games but make no mistake, they can have their drawbacks. Most people have come to terms with the reality that the world is a 24 hour a day, 7 day a week place. There are some remnants of the old school way of thinking such as evening newscasts, office hours and last call. The world of sports, especially soccer, has thrown out the idea of office hours. During the fall or spring you can almost watch soccer for 24 hours a day. From Australia’s A-League to the German Bundesliga to the Barclay’s Premier League in England to MLS in North America. Soccer can be found either on TV or online. All live and in HD. Just follow the sun and you’ll find soccer. You can do it from anywhere but it’s probably best to attempt this is from the West Coast of North America. If you start by watching an A-League game on a Friday night then snooze for a few hours. Get up before the sun for matches in the Netherlands, Germany and England and that should to take you until noon Pacific Coast time. At that point the MLS will take over for the rest of the day and end you’ll the day with a west coast game either in Seattle, Portland, San Jose or Los Angeles. It’s a commitment but so is 90 minutes on the pitch. Recently NBA Hall of Famer Magic Johnson offered LeBron James $1 million to be in next years Slam Dunk Contest during All Star Weekend. Fellow analyst and former NBA star Jalen Rose added that he’d like to see Blake Griffin in this contest as well. LeBron has never been in the Slam Dunk Contest. Will a million dollars get him to do it? Maybe but then again maybe not. While people around the internet debate the reasons why LeBron should or shouldn’t do the Slam Dunk Contest it begs the question, don’t fans want to see him in the Slam Dunk Contest? Compare LeBron’s situation to another sport, MMA. There have been countless times when a fighter has lost a fight and yet was content with the show they put on for the fans. The Wanderlei Silva vs Brian Stann fight this past weekend is a classic example. Both fighters are true warriors and have absolutely no intention of letting the judges decide who would win the fight. They had some amazing exchanges in the 1st round before Wanderlei found the right combination to knockout Stann in the 2nd. There are several fighters out there like Silva and Stann. So many that it’s hard to keep track. Fighters who put it all on the line and would rather put on an amazing fight for the fans then to play it safe and and take their chances with the judges decision. So why is LeBron playing it safe? Yeah, he may lose the Slam Dunk Contest if he enters but he also might lose his next game so what’s the difference? It’s part of being a competitor. Sometimes you win and sometimes you lose but the beauty of sports isn’t just winning, it’s putting on a memorable performance that lives on through the years. Much like Michael Jordan’s winning dunk at the 1987 Slam Dunk Contest where he took off -literally- from the free throw line. It wasn’t Jordan’s first Slam Dunk Contest. He lost his first one to Dominique Wilkins but the competitor he is made hime comeback to show that he was the best. Should LeBron enter the 2014 Slam Dunk Contest? Yes and if for no other reason then to do it for the fans. A new MLS season is kicking off in North America. With any new season in any sport there are a lot of question marks. 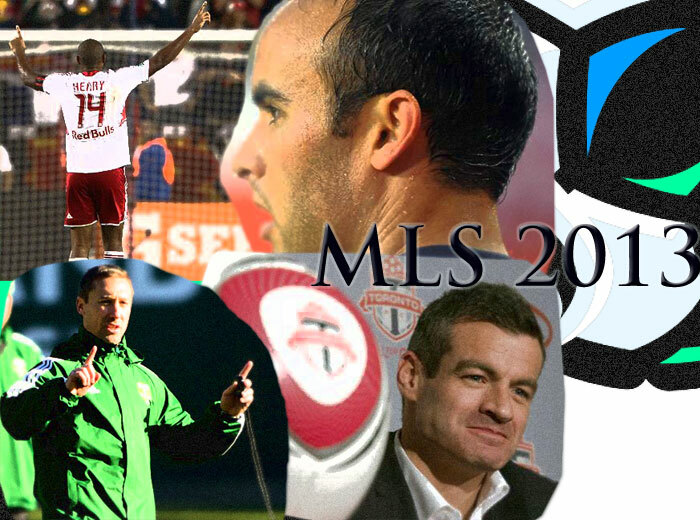 Below are our Top 5 things to look out for during this 18th MLS season. 5. New Coaches: There are 5 new head coaches roaming the sidelines in MLS this season and that now makes 12 former MLS players now managing clubs. Two of the biggest debuts square off in week one. Mike Petke of the New York Red Bulls and Caleb Porter for the Portland Timbers. Both teams have high expectations, a rabid fan base and a longing for MLS post season glory. 4. The Donovan Odyssey: US Soccer poster boy Landon Donovan has taken a leave of absence from soccer but is returning to the the 2-time defending MLS Cup Champions LA Galaxy at the end of March. 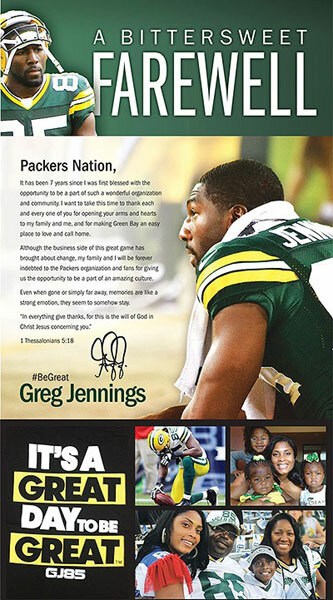 Will he be the same player on and off the field? Can he lead, along with Robbie Keane, the Galaxy to a 3rd straight MLS Cup? 3. Can Toronto FC Make The Playoffs? : Only the Red Bulls have gone through more coaching changes than TFC. However, the Red Bulls have been in MLS for all 18 years (formerly known as the MetroStars) while TFC kicks off it’s 7th MLS season on Saturday. They have never made the playoffs and after another off season of sweeping changes it is left to 1st time coach Ryan Nelsen to get this team into the MLS playoffs for the 1st time. 2. Running With The Red Bulls: The New York Red Bulls have arguably the most dangerous player in MLS in Thierry Henry. They’ve shaken up the coaching staff and the team but is it enough to get them their 1st MLS Cup? Maybe. If new signee Juninho can be half of what he was and the back-line and pull together then they may just be the team the beat. It’s a lot of ‘if’s’ but in the sports saturated New York market the Red Bulls have to win. Not just for the team but for the league. 1. No Beckham? No Problem: The loss of one of the world’s sports and entertainment icons shouldn’t slow down MLS or the LA Galaxy. The Galaxy will get Donovan back after a few games and they still have the man who lead them all the way to the MLS Cup glory in Robbie Keane. The league on the other hand is entering it’s 18th season and is bringing in more and more top talent from around the world. There is only one David Beckham but the level of play, energy and popularity of the sport are growing and with all due respect to Becks, he probably couldn’t have taken the league any further.